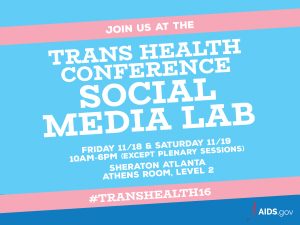 HIV.gov are offering a Social Media Lab (#TransHealth16) this week. HIV.gov is funded by the Secretary’s Minority AIDS Initiative Fund (SMAIF), and we are always looking for opportunities to share how digital tools can amplify HIV messages among communities of color at increased risk. We do this by hosting in-person social media labs at public health conferences, as well as by providing weekly phone-based sessions via Virtual Office Hours. If you’re attending the TransHealth Conference, the Lab is a space to ask questions that will extend your message on digital platforms. And if you can’t be there in person, just sign up for Virtual Office Hours). How: Conference attendees can just drop in with questions! Have a social media question but not coming to #TransHealth16 ? Sign up for Virtual Office Hours, tweet us , or send us a Facebook message .